October is finally here which means I can now lift my ban on pumpkin recipes, dust off the Halloween decor, and finally purchase my first bag of Halloween candy. Candy is better in miniatures, right?! The grocery stores have had Halloween things out since August but I make myself wait until October until I even think about it. Companies sure know my type –the type that buys holiday themed sprinkles and cookie cutters for every holiday. Instead of rolling out cookie dough and decorating Halloween themed cookies I decided to use these fun sprinkles in a quicker and easier recipe. One that can be mixed up quickly, still allows the kiddos to participate, and can be done in less than 30 minutes. 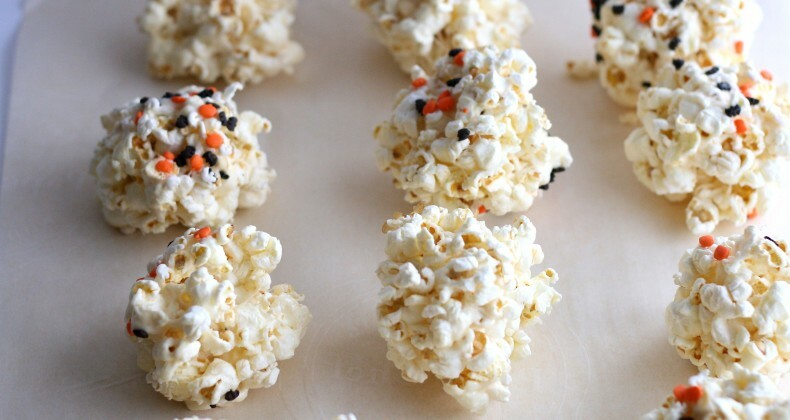 Popcorn balls are the answer! 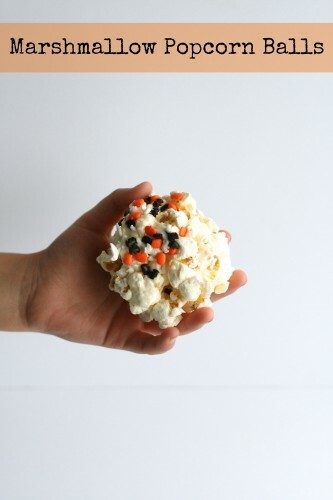 Popcorn balls are a total throwback to my younger days. I can remember them being dyed orange to look like little pumpkins. The kiddos wanted to help roll the popcorn balls so I skipped the orange dye and went with festive Halloween themed sprinkles instead. You could also stir in 1 cup of M&M’s or Reeces Pieces, nuts, dried fruit, etc. the options are limitless. Wearing rubber gloves helps protect little hands from the heat of the marshmallow mixture. An adult should mix the butter and marshmallows together. 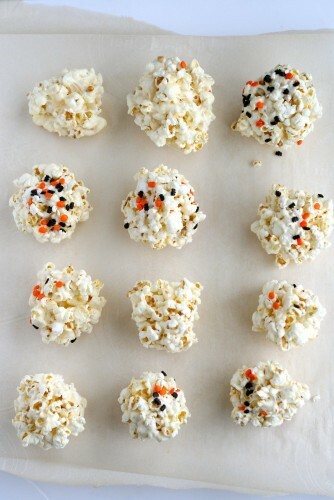 An adult or older child can stir the popcorn and marshmallow mixture together and children of all ages can form the popcorn balls once it has cooled slightly. Tonight I am guest posting over at The Good Life Moms. For those of you that don’t know Nebraska’s state slogan used to be Nebraska: The Good Life. Since I have been a resident in this great state I would have to agree. In a large bowl measure out 12 cups of popcorn. Set aside. In a large pot melt butter and marshmallows over low heat. Stir frequently. Pour marshmallow mixture over popcorn stir to combine. Stir in any mix-ins now. Allow mixture to cool slightly before forming into popcorn balls.